Also referred to as Anaheim, these chile peppers are among the most popular and commonly available chile in the United States. This medium-hot chile has a sharp, astringent flavor. 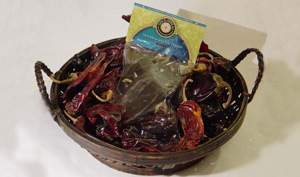 Use in Southwestern and New Mexican salsas, stuffings, and sauces. Excellent base for chili sauces or stews. 6 Heat Rating.